The 1995 NBA Finals was the championship round of the 1994–95 National Basketball Association (NBA) season. The series pitted the Orlando Magic against the Houston Rockets. The pre-series hype and build-up of the Finals was centered on the meeting of the two centers Shaquille O'Neal of the Magic and Hakeem Olajuwon of the Rockets. Going into the series the matchup was compared to the Bill Russell–Wilt Chamberlain matchup of the 1960s. The Rockets became the first team in NBA history to win the championship as a sixth seed. In addition, they became the first team in NBA history to beat four 50-win teams in a single postseason en route to the championship. The Rockets would win a playoff-record nine road games in the 1995 playoffs. In addition, the Rockets' sweep of the Magic was unique, in the fact that it was a "reverse sweep", where Houston won Games 1 and 2 on the road and 3 and 4 at home. It was also the second NBA Finals sweep in the 2-3-2 Finals format (after the Detroit Pistons did so against the Los Angeles Lakers in 1989). The Rockets also became the first repeat NBA Champion in history to keep the title with a sweep. In addition, the Rockets became the first team in NBA history to win the title without having home-court advantage in any of the four playoff rounds since the playoffs was expanded to a 16 team format in 1984. Coincidentally, this feat would also be achieved by the New Jersey Devils that same year, when they won the Stanley Cup over the Detroit Red Wings. The Orlando Magic (making their first ever NBA Finals appearance) began the 1995 NBA Finals at home, hosting the defending champion Houston Rockets. With the Magic up by three points late in Game 1, Nick Anderson missed four consecutive free throws in the closing seconds of the game, and Kenny Smith hit a three-pointer, tying the game and sending it to overtime as well as setting a new record with the most three-pointers in an NBA Finals game with seven. The more experienced Rockets went on to win in overtime and eventually swept the Magic, winning their second consecutive NBA Championship. In achieving this, they earned the distinction of being the only team to win both championships during Michael Jordan's first retirement (although Jordan did return in the closing months of the 1994-95 season), as well as the only one outside Chicago to win multiple championships in the 1990s. — Houston Rockets head coach Rudy Tomjanovich, on the floor of The Summit after winning the championship. Drexler puts the move on Anderson. Drexler with the finger-roll, the tip by Olajuwon! The Rockets lead, three-tenths of a second remaining. What a tip by Hakeem Olajuwon! — NBC announcer Marv Albert after Hakeem Olajuwon tipped in a missed shot by Clyde Drexler to give the Rockets a victory in Game 1. Smith circles out back, instead they give it to Drexler. Drexler driving, he goes, he puts it up, OH THE REBOUND! TIPPED IN! TIPPED IN! TIPPED IN BY HAKEEM! The Houston Rockets have stunned the Orlando Magic, and they win Game 1 of the NBA Finals in stunning fashion. — NBA Radio announcer Joe McConnell on the aforementioned play. The Houston Rockets have won their second consecutive NBA Championship! They have swept the Orlando Magic! — NBC announcer Marv Albert after Game 4. Clyde, this was your third trip to the finals and the third time was the charm. — NBC sportscaster Bob Costas on Clyde Drexler winning his first ring after Game 4. The Rockets' championship reign would end in 1996, where they were swept by the Seattle SuperSonics in four games of the second round. The Sonics were also the last team to beat the Rockets in the playoffs prior to their two-year championship reign, when they defeated them in seven games of the second round in 1993. That year, the Rockets won 48 games and achieved the fourth seed. The following offseason, the Rockets attempted to make it back to the finals by adding former NBA MVP Charles Barkley. However, age and injuries would take its toll, and the closest the Rockets would achieve after their two-year championship reign was a six-game loss to the Utah Jazz in the 1997 Western Conference Finals. In 2015, the Rockets now were led by James Harden and Dwight Howard, reaching the West Finals against Golden State Warriors. The Magic would have another strong season in 1996 winning 60 games. However, they were swept by the Chicago Bulls in the Eastern Conference Finals, who would go on to win the NBA championship after registering a league-record 72 wins. The following offseason, Shaquille O'Neal joined the Los Angeles Lakers, and went on to win NBA titles with the team in 2000, 2001 and 2002 (he would also win one with the Miami Heat in 2006). The Magic would not make it back to the finals until 2009; this time, they lost to the Lakers in five games. This was the last NBA Finals to use the traditional script font until 2003; beginning in 1996, they would use a new logo with a picture of the Larry O'Brien Trophy and the words "NBA Finals" along with the year in gold letters on a black background encompassed by a gold oval. 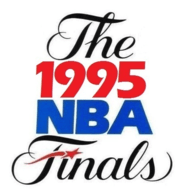 However, the new Finals logo only contains the words "The Finals" in the same script font as its pre-1995 incarnation, along with the NBA logo and trophy. ↑ History of the NBA Finals: Hakeem Olajuwon: The NBA’s Best In The Mid ’90s, hollywoodsportsbook.com, accessed February 16, 2007. ↑ NBA Finals Records, Basketball.com, accessed February 16, 2007.